One could live a lifetime in Mexico City, Distrito Federal (or simply “DF”) of Mexico, and never know all that there is to eat in the city that has it all. Street food is as ubiquitous as vehicles and traffic lights; it’s nearly impossible to walk a few meters without inhaling the smell of freshly pounded tortillas or coming across a vendor selling freshly cut fruit or squeezed juices, loaded sandwiches (tortas), tacos and many other local treats. In the last ten years or so, cutting-edge restaurants have popped up, serving some of the world’s best tasting menus, and the city’s array of gastronomic gems make for very difficult decisions. Mexico City has become a hot spot amongst travelers over the past few years, and frequent peregrinations can be boiled down to two elements: food and culture. The frenetic, sprawling city is 1485 square kilometers, and while no guide will cover it all, here’s a good start. This wildly popular bakery has the tastiest pastries in town, hands down. Panaderia Rosetta is a spin-off of Rosetta, a charming restaurant located in the trendy Roma Norte neighbourhood, where chef Elena Reygadas was baking such heavenly breads and pastries that its own separate bakery was warranted. The first Panaderia Rosetta opened blocks away from the restaurant and was an immediate success, as expected. Not too long after, Reygadas opened a second bakery in the upcoming Juárez area and, unlike the often-mobbed, hole-in-the-wall original bakery, the new one has ample patio and indoor seating and a significantly shorter wait time. While much of Reygadas’ technique is rooted in the European tradition, guava and ricotta danishes, sugary conchas and pulque bread make Rosetta a Mexican bakery at heart. The freshest seafood in Mexico City can be found at the ever-so-popular Contramar, a buzzy and vibrant restaurant from chef and restaurateur Gabriela Cámara. The interior of the 20-year-old restaurant is simple—vivid blue marine-themed murals, white tablecloths and an airy dining room that’s constantly packed with both locals and tourists alike. The menu, on the other hand, is not quite as simple, and is filled with spectacular riffs on local, home-style recipes such as the legendary red and green grilled snapper (half red chilli paste, half fresh green parsley), raw tuna tostadas, grilled octopus in red mole, and any of their ceviches. Do not leave without at least a bite of their famous fig tart or coconut flan. Our advice is to dine as the locals do—start at around 3 pm for an extended main meal (comida) that continues through the afternoon and into the evening. There are few better spots to enjoy the Mexican tradition of sobremesa (lingering over beverages and chitchat after a meal) and restaurants like Contramar are prime examples as to why lunch is treated as the most important—and longest—meal of the day in Mexico. Reservations are accepted and recommended, or arrive before one in the afternoon to avoid a long wait. Italian and Mediterranean cuisine with hints of Mexican flavour is what you’ll find at Lardo, an informal and convivial restaurant situated in the charming Condesa area. An open kitchen with a wood-fired oven sits in the middle of the bright and airy restaurant, and a striking bar makes for a perfect spot to appreciate the restaurant’s attractive wine list while nibbling on light snacks. On warm and sunny days, the restaurant’s full facade of French doors are drawn open, exposing the streets to a very handsome crowd. The focus at Lardo is on ingredients, which are carefully sourced seasonally and delicately prepared, and some menu highlights include homemade charcuterie, bright and refreshing greens, and the house special pizza with chorizo and burrata. Breads, both ones that accompany your meal or ones you pick up from the on-site bakery, may be some of the most delightful in the city. Reservations are highly recommended. Situated in the eclectic neighborhood of Juárez, Cicatriz Cafe is a lovely spot for quality coffee, home-baked goods, and fresh comfort food. The cafe is owned and run by New Yorker siblings, Scarlett and Jake Lindeman, and the fare takes influence from US favourites such as avocado toast, spiced and roasted carrots and kale-centric salads, all with local ingredients. For lunch, the “Big Salad” is a crowd favorite—tahini-dressed kale with beets, sprouts, jammy eggs and crisp pepitas. At night, the lights dim and the menu trims down to a simple yet colourful menu (the fried chicken sandwich is a must), and the space fills up with a trendy and artistic crowd eager to take advantage of the natural wine and cocktail list. The space itself is small yet open and breezy, with soaring ceilings, plaster walls, concrete floors, exposed beams and an upper level that lends itself nicely to people watching. 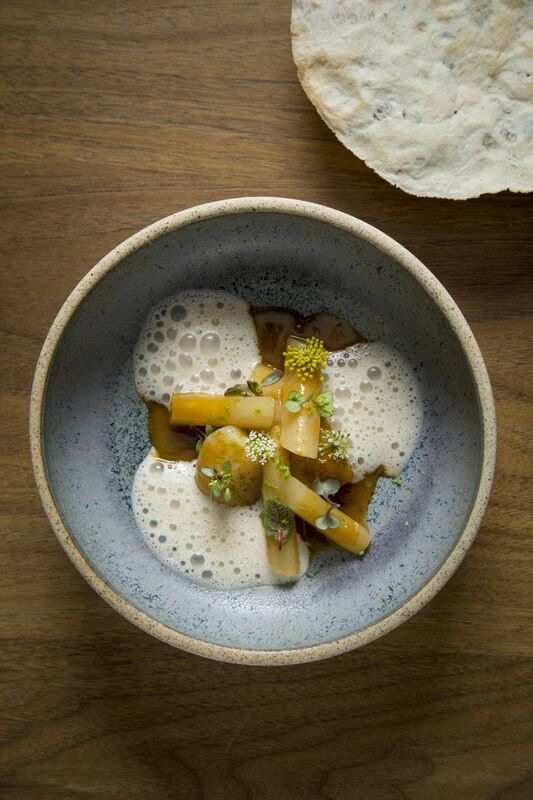 Everyone is going to tell you to make a reservation at Quintonil, and you absolutely should; the restaurant serves one of the most enlightened and ultramodern tasting menus in region, and it should come as no surprise that it often earns itself a place on the World’s 50 Best Restaurants list. Chef Jorge Vallejo opened Quintoil in 2012 after he completed stints at Enrique Olvera’s Pujol and Rene Redzepi’s Noma; Vallejo’s wife, Alejandra Flores, runs the dining room while he mans the kitchen. A la carte is certainly an option, but you’d be doing yourself a disfavor if you didn’t go with the ten course tasting menu. Most, if not all, of Vallejo’s dishes draw from traditional ingredients and dishes like cactus, mole, tostadas, tamales and indigenous insects. The menu changes consistently, but some standout dishes, such as the catch of the day with pureed guajillo chiles or the cactus nieve (shaved ice) have earned themselves regular appearances on the menu. Our advice is to reserve online as far out as you can, and request for a table in the sky-lit room in the back. Be sure to keep in mind that the restaurant is closed on Sundays. Here’s a bold (and justified) statement: Licoreria Limantour has been the leader in Mexico’s bar and cocktail scene since it opened its doors in 2011. The impressive bar brings a laid-back Latin vibe to its craft cocktails while still incorporating international elements, a combo that has earned itself first place on the list of Latin America’s Best Bars multiple times. The atmosphere at the two-story bar is sophisticated, a throwback to the golden age of Art Deco but without any cheesiness. The clientele is diverse, but all have one thing in common—they’re dedicated drinkers with an appreciation for exceptional beverages. The menu is split up into classics, house favourites and bestsellers, as well as seasonal cocktails, so there’s something for everyone and always a new drink to try. Ingredients are dynamic, and range from fresh herbs to flowers, fruits, infused syrups, shrubs, local spices, and rare foreign spirits. Mexican flavours can be found in creations like the Margarita al Pastor, which plays around with ingredients found in al pastor tacos, and the result is a tequila-based drink with pineapple juice, cilantro and a hint of serrano pepper. Mixologists regularly travel around the country to train others, so you can trust that your drink is in great hands. Allow yourself to get lost in this gigantic market, which occupies four whole blocks in the eastern edge of the historic center of the city, making it the largest market in Mexico City, as well as one of its oldest. From deep-fried crickets to every spice and chilli imaginable, Mercado de la Merced is dedicated to selling all sorts of produce, meats, prepared foods and other daily needs, and is a true cultural and sensory experience that is well worth your time, even if you walk away empty-handed (which is highly unlikely). Today, the market is split into seven different zones, the largest building being home to fruits and vegetables. The remainder of the market is a hodgepodge of goods, including birthday decorations, religious statues, shoes, handicrafts, toys, clothing and home decor. Le Merced is also known for its street antojitos, or snacks, so definitely plan to arrive with an empty stomach so that you can fill it with tortas, quesadillas, tostadas, elote and enchiladas. If you’re looking to purchase souvenirs to take home, look no further; you’ll surely find something for every type of friend and/or family member.